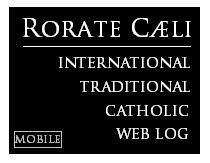 RORATE CÆLI: De Mattei - To the youth: there is only one way to be happy: be holy! 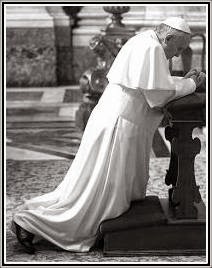 De Mattei - To the youth: there is only one way to be happy: be holy! On October 20, 2018, the Voice of the Family held a conference in Rome entitled Created for heaven: the mission of Catholic young adults in today’s world. This inspiring talk published below was delivered by Professor Roberto de Mattei. What to say to the young of today? I can say nothing other than what I tell myself each day: be holy. This isn’t an abstract question; it’s a concrete question that concerns each one of us, man or woman, young or old, nobody excluded. I need to be convinced of this: I might attain all the fortunes of life: health, wealth, pleasure, honors and power, but if I don’t become holy, my life will have been a failure. On the other hand, I might experience trials and tribulations of all sorts, I might appear a failure in the eyes of the world, but if I become holy I will have attained the true and only purpose of my life. Man was created to be happy. There is only one way to be happy: be holy. Holiness makes for man’s happiness and the glory of God. But how to be holy? By following my vocation. The vocation which God is calling me to. Following one’s vocation means doing the will of God. Whatever the vocation, it’s all about God’s will for us. Each person has their own specific vocation. What God asks of each soul, represents its vocation, which is the special form Providence wants each person to work and grow in. Every man has a special vocation since each has been wanted and loved by God in a different way. There are no two creatures alike, nor, in the course of history, have there been vocations absolutely alike, seeing as the will of God is different for every creature and every creature that has entered time, from nothingness, is unique. Father Faber dedicates one of his spiritual conferences to this theme: “All men have a special vocation” (Spiritual Conferences, Burn & Oates, London 1906, pp. 375-396). Each man has a specific vocation, different from that of any other man, since God loves every one of us with a special love. What does this special love of God for me consist of? First of all, God created me, giving my body and soul the characteristics and qualities that pleased Him. God did not only create me, He keeps me alive, providing me with the being in which I live. If God ceased even for a second to imbue my being, I’d fall into that nothingness from which He brought me forth. God, after creating us, has not left us to the mercy of chance. Each hair on our head has been counted (Mat. 19, 30), and not one hair falls without the Lord’s permission. (Luke, 21,18). And if the number and fall of my hair are all calculated – what then, is not going to be calculated in our lives? “God does not look at us merely in the mass and multitude”, writes Father Faber. “From all eternity God determined to create me not simply a fresh man, not simply the son of my parents, a new inhabitant of my native country, but he resolved to create me such as I am, the me by which I am myself, the me by which other people know me, a different me from any that has ever been created hitherto, and from any that will be created hereafter”. “It was just me, with my individual peculiarities, the size, shape, fashion and way of my particular single, unmated soul, which in the calmness of His eternal predilection drew Him to create me” (Spiritual Conferences, p. 375). In short, God has traced the laws of my physical, moral and intellectual development along with the laws of my supernatural growth. How did He do this? Through instruments. What instruments? These instruments are the creatures I meet in my life. The Carthusian, Dom Pollien, invites us to calculate the number of creatures that have been part of the reality of our existence (Cristianesimo vissuto, Edizioni Fiducia, Roma 2017). The physical influences of time, seasons and climate, the moral influences of relatives, teachers, friends and [even the] enemies we have met along the way; all the books we have read, the words we have heard, the things we have seen, the situations in which we have found ourselves – nothing is by chance, given that there is no such thing as chance – everything has a significance. These influences, these movements are the work that God performs in us. All these creatures, explains Dom Pollien, are placed in motion by Him and they do nothing other than what God wants them to do in us. Everything occurs at a given time; it acts on the right point, it produces the movement necessary to exercise a physical, moral or intellectual influence on us. This influence is actual grace. Actual grace is the supernatural action that God exercises on us at every moment, through creatures. Creatures are instruments that bring grace. They are the instruments of God for one purpose only: the forming of saints. Everything that happens, all that one does, St. Paul says, everything without exception, contributes to the same work and this work is the good of those that the will of God calls to holiness (Rom, 8,28). Nothing fails towards this purpose, everything converges towards this outcome. Actual grace is everywhere and intimately connects the natural and the supernatural. And God proportions the quality of His graces to the needs of our life, according to the designs of His mercy towards us and according to the response we lend to His action. How do we respond to this uninterrupted action of grace on our souls? We let God act on our souls, without ever worrying about tomorrow, since, as the Gospel says ‘sufficient for the day is the evil thereof’ (Mathew, 6, 34). “Let God act”, said Cardinal Merry del Val: “Remember that circumstances which you yourself have not occasioned are God’s messengers. They come a thousand times a day to tell you the different ways in which you may show Him your love”. Val (Let God Act, Talacre Abbey, 1974, p. 2). A religious who lived very closely with St. John Bosco was asked whether the Saint was ever worried in the midst of his countless works, in his sometimes tumultuous life. The religious replied in this manner: “Don Bosco never, not even a minute before, thought about what he was about to do a minute later.” Don Bosco, who understood the action of grace, always sought to do the will of God in the present moment. And following this path he fulfilled his vocation. In Rome, next to the central station, stands the Basilica of the Sacred Heart, built by Don Bosco just before his death, at the cost of immense sacrifices. The Basilica was solemnly consecrated on May 14th 1887 by the Cardinal Vicar in the presence of numerous civil and religious authorities. On May 16th 1887, Don Bosco himself offered Mass at the altar of Mary, Help of Christians: it was his only celebration in the Church of the Sacred Heart and, as a plaque appended on the centenary of the event commemorates, the Mass was interrupted fifteen times by the sobs of the old priest, who understood the significance of his famous “dream of 9 years”. God showed him the vast panorama of his life and revealed to him how, from his childhood, he had been prepared and led by God to fulfill his earthly mission. Every soul has its vocation, because it has its different function in the Body of the Church. He who has the vocation of marriage, doesn’t have it for himself, but for the Church. He who has a religious vocation, doesn’t have it for himself, but for the Church. This vocation, writes Father Faber, flows directly from our eternal predestination, but is entrusted to the hands of our free will and depends on it: “I clearly belong to a plan, and have a place to fill and a work to do which are all special; and only my speciality, my particular me, can fill this place or do this work”. This means that I have a tremendous responsibility. “Responsibility is the definition of life. It is the inseparable characteristic of my position as a creature” “From this point of view life looks very serious” (Spiritual Conferences, p. 377). There is no other path that leads man to the holiness which everyone is called to, in order to be happy. Let us go along this path with the help of Our Lady and the Angels. God has placed us near an Angel to guard our vocation. Our Guardian Angel is our vocation perfected; our vocation fulfilled. He is the model for our vocation. For this we need to pray to him and listen to the words he whispers. There are vocations for single people; there are vocations for families, which are not only natural ones, but also those spiritual families, with their charisms; there are vocations for the peoples of nations, which Plinio Correa de Oliveira spoke of frequently. Each nation has a specific vocation, which is the role that Providence has entrusted to it in history. But we were not only born into a family and a nation. We live inside a historical age. And since history is also a creature of God, in every historical age God asks for something different. Every historical age has its vocation. The predominant vocation in the first centuries of the Church was the predisposition for martyrdom. Is there a vocation in the 21st century, in which one can find one’s individual vocation? The vocation for our age is to correspond to the desire of Heaven which Our Lady Herself showed us at Fatima: In the end my Immaculate Heart will triumph. This is the vocation of those in the cloisters, in the public squares, who, with prayer, penitence, words and action, battle for the fulfillment of this promise. The triumph of the Immaculate Heart of Mary is also the triumph of the Church, since the Immaculate Heart of Mary is the very Heart of the Church Itself. This triumph suggests a great battle preceding it. And since this triumph will be social, public and solemn, this battle will also be social, public and solemn. Today, being saints means fighting this battle, which is fought, first and foremost, holding the sword of truth. It is only upon the truth that the lives of men and nations can be built, and without the truth, a society breaks down and dies. Today, Christian society has to be remade; and to remake it, the prime necessity which is called for, is that of professing and living the truth. When a Christian, with the help of Grace, conforms his own life to the principles of the Gospel and fights in defense of the truth, he cannot be hindered by any obstacle. “God and the Church – writes Dom Pollien in Cristianesimo vissuto – ask for defenders, but real defenders; those who never shrink back one step; those who know how to be faithful to orders until death; those who are formed in the rigours of discipline, in order to be ready for all the heroisms of the fight.” (p. 162). The French writer Paul Claudel, enunciated this great truth: “Youth was not made for pleasure but for heroism”. The young of the 21st century cannot be attracted by the invitation of compromise with the world, but are asking the Church for a call to heroism. Cristianesimo vissuto means militant Christianity. In the Middle Ages, at the building of a cathedral, architects, stone-masons, blacksmiths, carpenters, bishops, princes, illustrious and unknown personalities all participated, united in the same desire to render glory to God through the stones they raised to Heaven. We are also participating in a great project. Each one of us today is called to build the immense cathedral dedicated to the Immaculate Heart of Mary on the ruins of the modern world - which is nothing other than Her Reign in souls and society. Our hearts are the stones and our voices proclaim to the world a dream that will come true.